I love fall and all the wonderful color we get to see all around us when the leaves change here in West Michigan. And collecting colorful leaves is one of my favorite ways to preserve the beauty of the season. In the past I’ve used old phone books to press the leaves I collect, but this year I decided it was high time that I make some sturdy presses for my daughters and I to use on our leaf collecting adventures. And I have to say that having an actual leaf press makes the the process seem like very official business and, if you can believe it, even more fun. Seriously. These presses are so easy to make, you’ll be tempted to make dozens. Start by placing a piece of cardboard on top of one of the wood squares and then place a piece of paper towel on top of of the cardboard. Put a single layer of leaves on the paper towel layer and cover with another paper towel and piece of cardboard. Keep adding layers like this until all your leaves are inside. Then place the second piece of wood on top of the stack and secure with cotton webbing straps. Keep the leaves in the press, tightening the straps periodically, for about a week. You can place the press under a stack of books to add weight if you’d like. After about a week, your leaves will be ready to use for a variety of fall art projects. My latest favorite project is making leaf people. 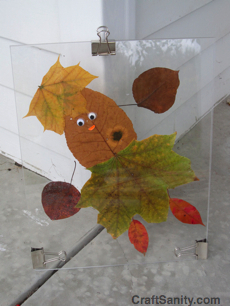 Simply arrange leaves on a piece of plastic glass and tape in place when you’re happy with your design. Use binder clips to secure your leaf person between the plastic. Glue googly eyes to the outside top layer of plastic to add just the right dose of personality. These can be hung on the wall from the top clip for speedy seasonal decorating. 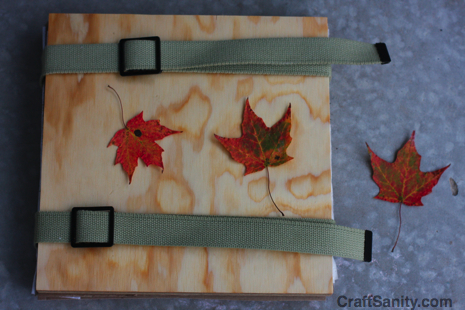 Below you’ll find my latest “Take Five” segment demonstrating fall craft projects. Enjoy! Note: I’m collecting handmade Halloween ideas now, so tell me what you make. If it’s a project I can work into an upcoming TV segment or column, I’ll give you a shout-out on the air/in print and online.